Why did the vibrant social democratic traditions of Europe and North America collapse so swiftly in the face of the pervasive propaganda of the neoliberal project? Was it because the post-war golden age of Capitalism – les trentes glorieuses as the French call the period of record growth and stability between the 1940s and 1970s – imploded in the face of its internal contradictions? Or was it because a series of Big Lies had been propagated by leading economists and corporate-funded thinktanks, and subsequently lapped up by a grateful business community and by politicians? This blogger tends towards the latter view. In 1988, with Reaganomics and Thatcherism in their heyday, I was a high-table guest at the annual dinner of the Jersey branch of the Institute of Directors (a right wing lobby organisation). I had been invited because I had recently taken up post as economic adviser to the government of Jersey (a British tax haven), and there was some curiosity about my appointment. I found myself seated beside the chief executive of the offshore division of a leading UK bank (which incidentally collapsed during the 2008 financial crisis and required a massive government bailout). For an unbearable two hours I endured his paeans to what had become known as supply-side economics: corporate tax cuts stimulate investment; wealth trickles-down to poorer people; deregulation ‘frees’ investors from forests of ‘red-tape’, and business investment is invariably more ‘efficient’ than public expenditure. On and on he went, and I listened politely, but the minute the meal ended and I could get up and leave without causing undue offence, I interrupted him and said that I could only take his ideas seriously when he could back them with evidence, and in the real world there was no evidence to support his nostrums. Since privatisation of Britain’s rail industry, train fares in England have become the most expensive in Europe, while trains have become less comfortable, slower, less productive and less environmentally friendly than their counterparts in France, Germany, Italy and Spain. This blogger’s water bills have increased threefold in real terms since privatisation, without any observeable improvement in service (same water, same pipes) and little or no additional investment in water infrastructure. Privatisations have led to the replacement of full-time jobs with part-time. Wages have halved in real terms in some industries. Executive earnings have increased more than tenfold. In what possible way can these privatisations be considered a success story? Consider also the consequences of deregulation and cutting ‘red tape’. According to British Prime Minister David Cameron “European red tape is throttling business”. OECD research shows that Britain has the second lowest product market regulation in the world. Has this improved the business climate in Britain? Investment in productive industry and research and development remains low, financial deregulation encouraged criminal practices throughout the banking sector, consumers have little protection from bad business practice (horsemeat sold as beef, for example), and between 2010 and 2014 there were only two prosecutions of employers for breaching minimum wage law. Without the discipline of state-enforced regulation, bad business practice drives out good practice, and businesses compete in a mindless race-to-the-bottom. The term trickle-down originated as a gag by US vaudeville star Will Rogers during the Great Depression. The sick part is that Rogers’ joke morphed into a myth, eagerly adopted by influential economists, business leaders, media commentators, thinktanks, politicians, and by a large and gullible part of populations across the world. Rising inequality throughout the world (see Piketty et al) provides testimony to how powerful myths, supported by Big Lies, can over-ride rational arguments in the absence of resistance. Supply-side Capitalism has failed at every level. It has not created prosperity for the 99 percent. It is failing to protect the global ecosystem. It is failing to invest in new technologies and jobs for the 21st century. Big businesses have become recipients of huge direct and indirect corporate welfare subsidies. It has created unprecedented inequality and corrupted democracies around the world, Supply-side economics turbo-charged the criminogenic environment of offshore tax havens. Intellectually trapped by the mythology of supply-side economics, politicians continue to race head-long to the bottom. Who on earth would want to win such a race? 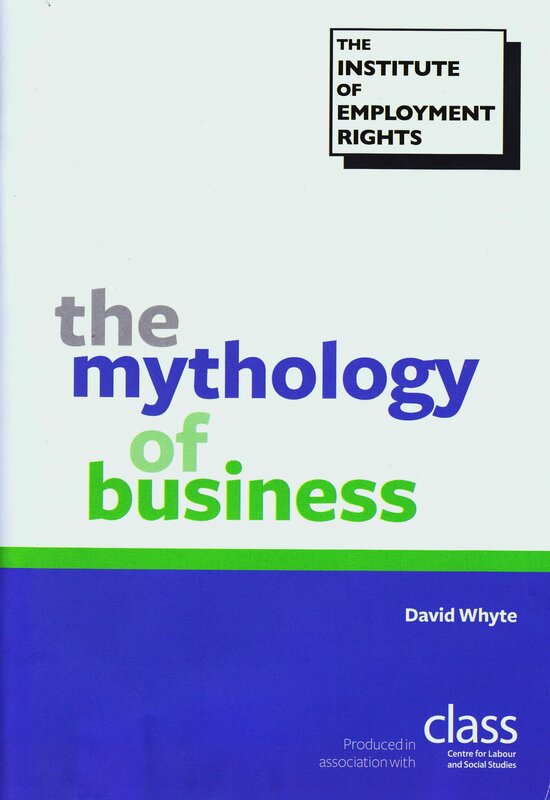 ‘The Mythology of Business’ provides a short, accessible and compelling exposé of ten of the most popular zombie myths of these times. As David Whyte comments, these myths have a singular purpose: “to sustain corporate greed at the expense of the rest of us.” We have a duty to question these myths, to expose the lies that sustain them, and to challenge the politicians and opinion-formers (including zombie economists in academia) who mindlessly repeat these myths despite the lack of evidence that any of them hold any meaningful truth. I love the approach to pulling back the current through the use of language like Myth, and the Mythology of Business. While I am not an economist, I am a performance improvement consultant trying in my/our way to help society and the species evolve by helping them interact with “reality” rather than the “illusion” of linear causal mechanics … promoted from the top-down. Would love a copy of the book, just to get an understanding of your perspective on what I am assuming is the influence of the macro-economic filter on business and ultimately causality for the masses.